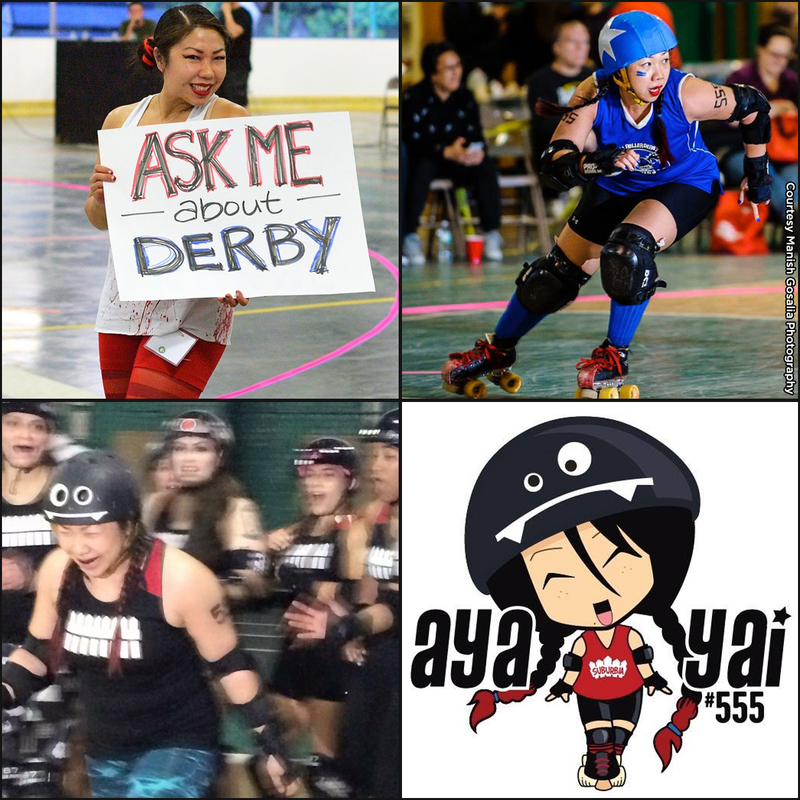 I have been involved with roller derby since 2009-ish and competing since 2012. Fall of 2011. Wow. Time goes by so fast when you’re having fun. I have been roller skating since I was teensy and it was my main mode of transportation for the longest time. One day, I searched for skate rinks in NYC and found roller derby. After watching my first game, I was enthralled. It combined all my favorite things: roller skates, going fast and hitting people! I immediately signed up for a basic derby skills course with Gotham Girls Roller Derby and realized it was also about athleticism, sports(wo)manship and strength of mind and body. I was sold. SO many reasons. This is my 6th year with Suburbia and for the past few seasons I have been saying that I will retire but I just keep coming back. Roller derby always presents a challenge for me. There is always room for growth and learning. It is my release and salvation from the everyday. At every practice I feel like I do something better, harder or faster and it’s so gratifying. Even on a bad day, you are always happier on roller skates. It also helps that I have the most awesome bunch of leaguemates to look up to and look forward to hitting the track with. I have two… One was my first official interleague game after breaking my fibula 6 months prior. It was at the very same venue and against the very same team that we were scrimmaging against when I got hurt. There couldn’t have been a better opportunity to redeem myself. I played strong and didn’t let anything hold me back. It made me realize how amazing you can be with the right support system and some hard work. The second proudest moment was when I was working a home game as the “Ask Me About Derby” girl. A little girl came up to me and asked, “What makes you love playing roller derby?” My memory is fuzzy but I am pretty sure a spotlight shined down on us and all the lights dimmed as I knelt down to look her straight in the eye. I said, “Roller derby makes me feel strong, smart and loved. You can be any kind of girl and find a place in derby.” She smiled wide and said, “When I grow up I wanna play roller derby too!” My ovaries exploded. My day was made. I randomly pet strangers’ dogs, bake or eat baked goods, watch reruns of old sitcoms, try to get the most efficient workout in the least amount of time, and I’m a graphic designer. You can often find me skating around the neighborhood doing any combination of these things. What are you hoping to do this season? I’ve taken on some coaching this year and was also re-elected assistant captain for our travel team, Brawl, so I hope to work with the league to bring our skills and rankings up. We’ve grown so much in the past year and the pool of talent and potential is so great, I’m really looking forward to us showing off our hard work on the track. Personally, I always have a lot of skills I want to improve on like my left-side-everything and endurance. So tl;dr, I want to have fun and win! Chase Danger Is April’s Member of the Month!